Aristotle University, Thessaloniki, Greece, 1989. University of Houston, Houston, Texas, 1994. Tumor Microenvironment, Tumor Metabolism, Integrated Stress Response, drug screens, radiosensitizers. Delineation of mechanisms of resistance to tumor microenvironmental stress, with emphasis on the Unfolded Protein Response in cancer. Development of small molecule agents to target these mechanisms as novel targeted modalities. Development of novel radiosensitizers. 1. To understand the mechanisms by which components of the microenvironment (e.g. hypoxia, low nutrient availability) interact with cellular survival/apoptotic pathways to produce a more resistant tumor phenotype. Once we understand the regulation and function of these survival pathways, we then design cell-based and assays to screen small molecule libraries for compounds that inhibit these processes and test them alone or in combination with genotoxic agents in several animal tumor models. 2. To increase the therapeutic effectiveness of ionizing radiation (IR) by either employing existing compounds with relatively safe toxicity profiles or employ screening strategies to identify novel and potent radiation sensitizers. We are also interested in developing novel delivery approaches for such compounds, such as biocompatible nanoparticles. Currently the lab is accepting 2 new rotation students. 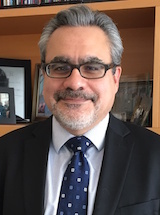 Dr. Koumenis focuses on radiation and tumor biology, particularly the role of UPR in hypoxia resistance and angiogenesis and the development of novel radiosensitizers. Verginadis II, Kanade R, Bell B, Koduri S, Ben-Josef E, Koumenis C: A Novel Mouse Model to Study Image-Guided, Radiation-Induced Intestinal Injury and Preclinical Screening of Radioprotectors. Cancer Res 77(4): 908-17, Feb 15 2017. Xu Z, Bu Y, Chitnis N, Koumenis C, Fuchs SY, Diehl JA: miR-216b regulation of c-Jun mediates GADD153/CHOP-dependent apoptosis. Nat Commun 7: 11422, May 13 2016. Lehman SL, Cerniglia GJ, Johannes G, Ryeom S, Koumenis C: Translational upregulation of an individual p21Cip1 transcript variant by GCN2 regulates cell proliferation and survival under nutrient stress. PLoS Genet 11(6): e1005212, Jun 2015. Dey S, Sayers CM, Lehmans S, Cheng Y, Cerniglia G, Tuttle S, Feldman M, Zhang P, Fuchs S, Diehl AJ, Koumenis C: ATF4-dependent induction of heme oxygenase 1 prevents anoikis and promotes metastasis. J Clin Invest 125(7): 2592-608, Jul 1 2015. Ma XH, Piao SF, Dey S, McAfee Q, Karakousis G, Villanueva J, Hart LS, Levi S, Hu J, Zhang G, Lazova R, Klump V, Pawelek JM, Xu X, Xu W, Schuchter LM, Davies MA, Herlyn M, Winkler J, Koumenis C, Amaravadi RK. : Targeting ER stress-induced autophagy overcomes BRAF inhibitor resistance in melanoma. J Clin Invest 124(3): 1406-17, Mar 2014. Sayers CM, Papandreou I, Guttmann DM, Maas NL, Diehl JA, Witze ES, Koong AC, Koumenis C: Identification and characterization of a potent activator of p53-independent cellular senescence via a small-molecule screen for modifiers of the integrated stress response. Mol Pharmacol 83(3): 594-604, Mar 2013. Hart LS, Cunningham JT, Datta T, Dey S, Tameire F, Lehman SL, Qiu B, Zhang H, Cerniglia G, Bi M, Li Y, Gao Y, Liu H, Li C, Maity A, Thomas-Tikhonenko A, Perl AE, Koong A, Fuchs SY, Diehl JA, Mills IG, Ruggero D, Koumenis C: ER stress-mediated autophagy promotes Myc-dependent transformation and tumor growth. J Clin Invest 122(12): 4621-34, Dec 2012. Marotta D, Karar J, Jenkins WT, Kumanova M, Jenkins KW, Tobias JW, Baldwin D, Hatzigeorgiou A, Alexiou P, Evans SM, Alarcon R, Maity A, Koch C, Koumenis C: In vivo profiling of hypoxic gene expression in gliomas using the hypoxia marker EF5 and laser-capture microdissection. Cancer Res 71(3): 779-89, Feb 2011. Chitnis NS, Pytel D, Bobrovnikova-Marjon E, Pant D, Zheng H, Maas NL, Frederick B, Kushner JA, Chodosh LA, Koumenis C, Fuchs SY, Diehl JA: miR-211 is a pro-survival micro-RNA that regulates chop expression in a PERK-dependent manner. Mol Cell 48(3): 353-64, Nov 2012. Ye J, Kumanova M, Hart SL, Sloane K, Zhang H, De Panis DN, Bobrovnikova-Marjon E, Diehl A, Ron D, Koumenis C: The GCN2-ATF4 pathway is critical for tumour cell survival and proliferation in response to nutrient deprivation. EMBOJ 29(12): 2082-96, Jun 2010.